All over Oregon, landowners are planting native trees and shrubs to restore forests to places they once thrived. 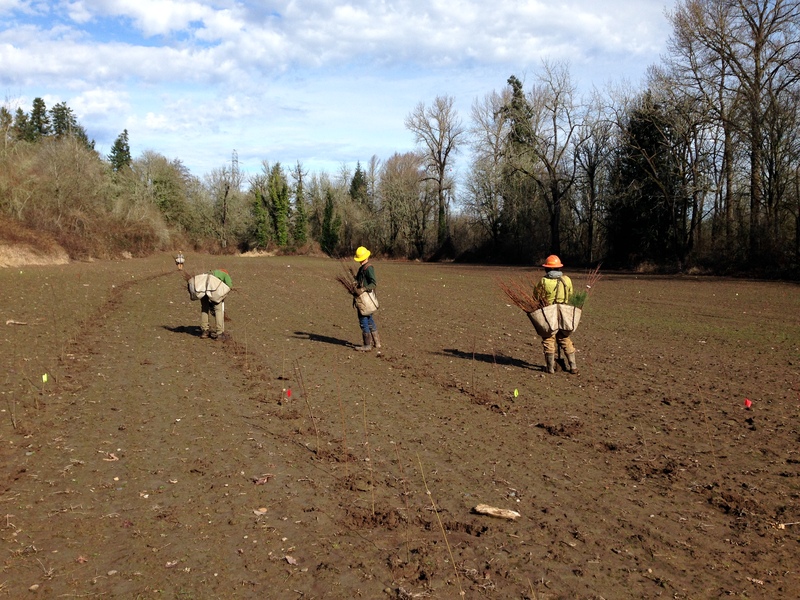 In the Willamette Valley, this work often focuses on restoring forests within the floodplains of rivers. When a water body interacts with its floodplain, whether it is for a few days or for months at a time, all sorts of amazing things happen! Wintertime floodwaters doing their thing at Eldridge Bar Landing on the Willamette. Water quality can be improved significantly when water interacts with the floodplain. Water velocities will slow, allowing suspended sediments (dirt, sometimes carrying pollutants) to settle out of the water and deposit on the floodplain, resulting in less turbid (dirty) water, which is good for aquatic species and for people. Depending on the composition of the soil in the floodplain, water can soak into the ground and replenish groundwater, or water can pond on clay deposits and create wetlands which support a diverse array of wildlife. When water soaks into groundwater, it can stay there for weeks or years, and over time will become cooler. This cooler water often seeps back into the river creating cold water zones that cold-water fish, like salmon, can use for migration, resting, feeding or spawning. 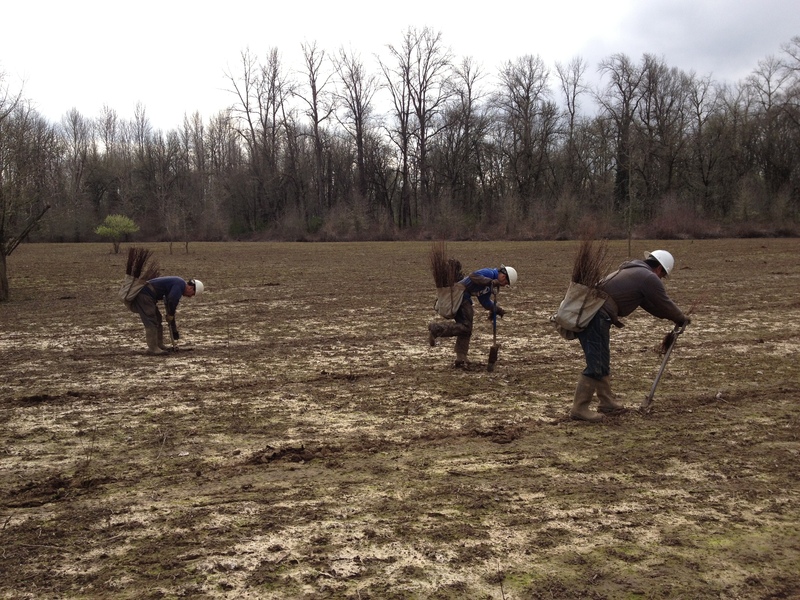 Several phases of planting in riparian and floodplain areas are underway at Elijah Bristow State Park, located on the Middle Fork Willamette. Water also picks up a lot of material when it interacts with the floodplain, ranging from small particles of leaves and insects to huge trees. Many of Oregon’s native fish and wildlife are dependent on these materials to provide food or suitable habitat to survive. Salmon, for example, will eat insects picked up by floodwaters, and they also depend on diverse habitat in the river that large log jams formed from floodplain trees can provide. Salmon are only one example of a large number of native species that depend on good water quality and complex aquatic habitat. Darrow Rocks Landing was tilled as part of site preparation and broadcast seeded with native grasses to provide a cover crop. Planting crews installed over 11,000 native trees and shrubs in February 2014, and the site will now be maintained intensively through mowing and control of competing weeds using herbicide for 3-5 years until the plants reach a point that they will continue to thrive without management intervention. The Willamette River is located just off the property on the right. Even when floodwaters don’t actually reach a nearby forest, a mature native forest located near a river (a riparian forest) can still provide numerous benefits including shade to cool river water, and habitat for the large number of species who depend on riparian habitat in Oregon. These hardwood forests provide wintering habitat and movement corridors for songbirds, mammals, amphibians and reptiles. Breeding and migratory bird densities in cottonwood-dominated riparian forests are generally the highest of all habitat types in North America. One small part of the expansive planting area at Luckiamute State Natural Area. 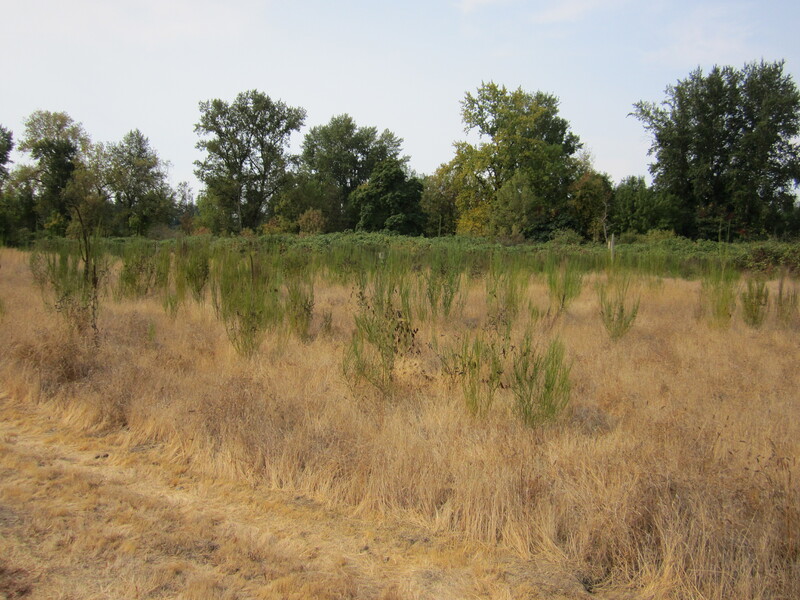 This spot is in a wetland and was planted densely with shrubs that prefer wet conditions This park is located at the confluence of the Willamette, Luckiamute and Santiam Rivers. 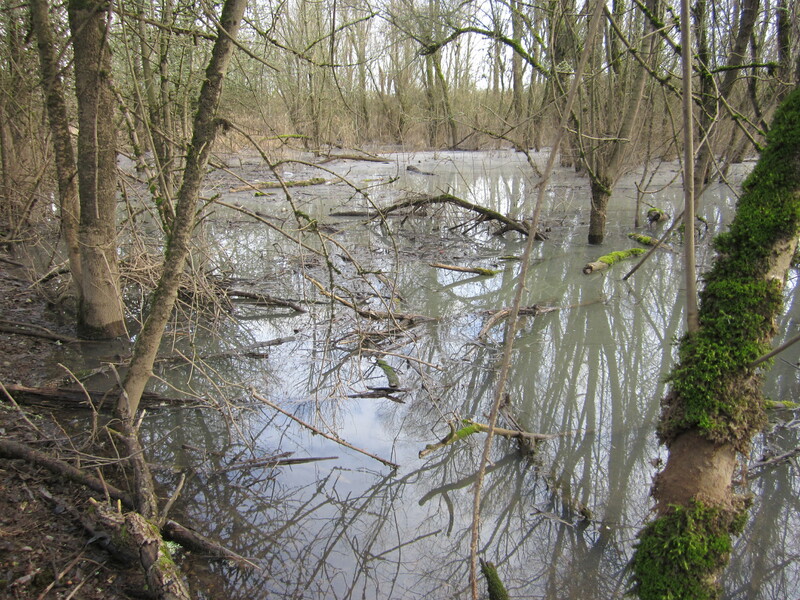 Oregon State Parks has partnered with numerous organizations and individuals to restore floodplain forests at sites along the Willamette River. The Willamette is one of many rivers that have been largely disconnected from its floodplain over time as other land uses have come to dominate the landscape. 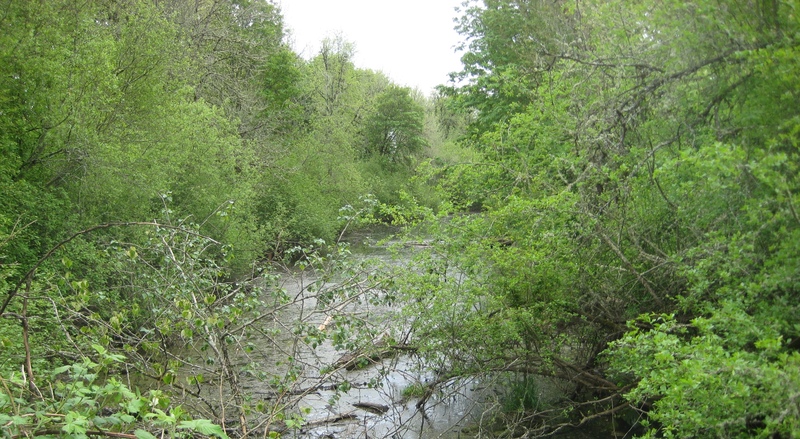 In the 1850s it is estimated that hardwood riparian/floodplain forests occupied 67% of the riparian zone along the Willamette River main-stem, reduced to less than 10% by 1990. Many of OPRD’s Willamette River Greenways and some of our state parks and natural areas contain areas that used to be dominated by forest, where land conversion has occurred over time. 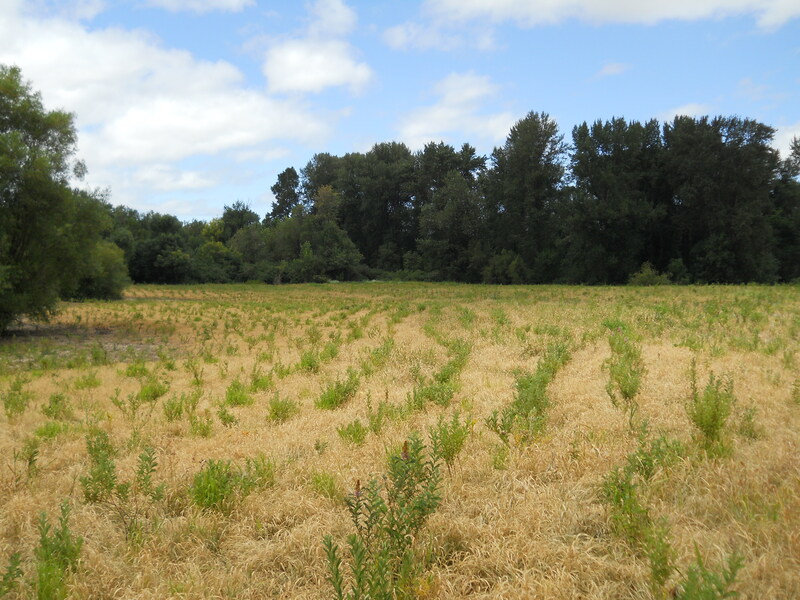 Willamette Mission State Park floodplain area, prior to site preparation (control of Scotch broom and Armenian blackberry) which began in February 2014. The Willamette River is located just past the tree line in this photo. To properly start a forest from scratch, you need to keep in mind a number of principles borrowed from the fields of forestry, botany, and agriculture. The density, arrangement and species composition that you plant in year 1 will influence how your forest appears and functions in 10, 50, and 100 years from now, at maturity. Different species have vastly different tolerances to environmental conditions, such as flooding, animal damage (deer, voles, beaver, etc. ), competition with other plants, drought, and other factors. These differences will influence which species survive over time and are present in your future mature forest. How you prepare your site prior to planting, and how you manage your planting area for the first 5-10 years will also greatly influence your future mature forest. An example of a mature cottonwood and ash dominated floodplain forest at Bower’s Rock State Park. 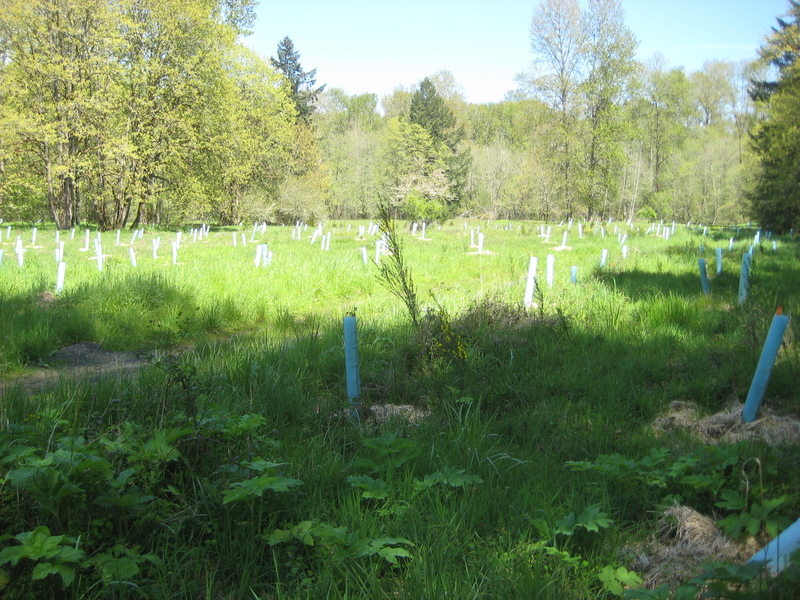 Restoration practitioners in the Willamette Valley have implemented a number of different approaches to floodplain and riparian forest restoration, with none of them being inherently “right” or “wrong”. Instead, your chosen approach will depend on your desired future condition (i.e. what you want your site to look or function like at some time in the future), what your starting site conditions are, what foreseeable problems may come up at a site, planned management interventions at the site , and of course, what financial and staff resources you have available. Notable examples of floodplain and riparian forest restoration work occurring at Oregon State Parks sites within the Willamette Valley include Luckiamute Landing State Natural Area, Half Moon Bend Landing, Darrow Rock’s Landing, Elijah Bristow State Park, and Willamette Mission State Park. These projects are using a variety of approaches in their density, arrangement, and species composition based on site specific conditions. Over time, all of these project areas will mature and begin to provide the ecological functions of improved water quality, shade, habitat complexity, and food sources for native fish and wildlife. At Half Moon Bend Landing, native trees and shrubs were installed in March 2013, with another smaller area planted in March 2014. This site was laid out in blocks where different densities and arrangements of species were installed.